Go on your computer, open your browser, and wait for a few seconds. Bam, you are ready to jump into a multiplayer world of fantasy and adventure. This was highly appealing to MMO enthusiasts five years ago, at a time where accessibility and convenience was prioritized. Conversely, today’s market is characterized by high definition graphics, dynamic gameplay, and complex storylines. Moreover, whilst the original pioneer titles in Web MMO are commendable in numerous ways, the genre has taken a wrong turn. With fierce competition and inherent shortcomings in mind, do Web MMOs still have a place in today’s market? We will answer this question through analyzing the example of Crystal Saga, a very basic Web MMORPG. For one reason or another, publishers of more recent Web MMOs have resolved to focus upon earning short-term profits from their games. This may be explained through that publishers have recognized Web MMOs to be a dying genre, which will not live past the decade. Accordingly, their games are essentially cash cows, and the logical viable option is to squeeze every penny out of them whenever still possible. In Crystal Saga, this approach is translated into a highly overpowered cash shop. 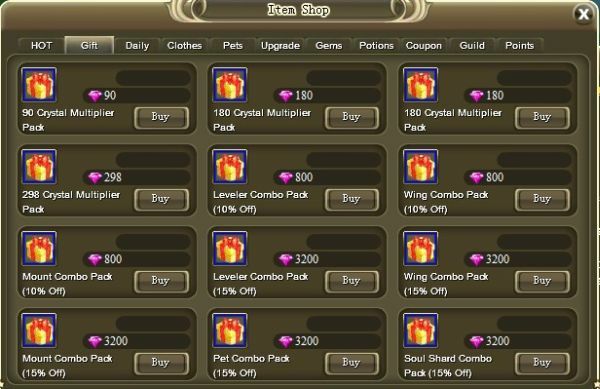 Buying cash shop items offers too many benefits, and greatly accelerates a player’s leveling process. It reached such an extent that it was almost impossible to get by in the game without making at least one micro-transaction. However, furthermore, Crystal Saga further exploits its cash shop through additional ways. Most importantly, whether intentional or not, the game has an absolutely overwhelming number of servers. It literally releases at least one sever per fortnight or so. It now has a total of 80 servers. And how does this help the cash shop? Well, it minimizes the amount of the active player population per server. Surely, all players want to play on the newest server, to gain a competitive advantage over other players. Yet, cash shop items cannot be carried across from one server to another. 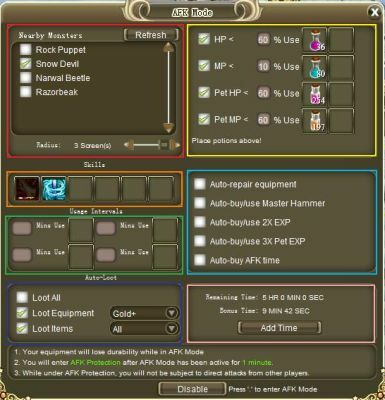 Hence, effectively, when players want to migrate to a new server, they have to repurchase their existing premium items. Moreover, continuous server releases also stimulate players to capitalize upon the opportunity to gain a head start. This means that timed experience points accelerators, such as ‘Double Exp. Tokens’, which are strictly cash shop items, will be very popular and receive a significant boosts in sales. Needless to say, Crystal Saga’s cash shop items are problematic in the first place. Simply put, there has been too large of a focus upon items which makes gameplay much easier. Such items are plentiful, whether it is faster experience gains or easier pet captures. These days, this issue is quite widespread amongst Web MMOs as a whole. In particular, it is endorsed to a maximum extent by web based multiplayer RTS’s. Even the very successful industry leader Travian provides players with the option to purchase resource accelerators using real currency, which multiplies their resource production rates. However, Travian is sensible enough to offer multipliers of reasonable rates. Conversely, in smaller titles such as Three Kingdoms Online, multipliers are significantly large, and have the potential of completely breaking the game. True, in such a genre where each round is limited by time, time becomes the most valuable resource. Hence, it is not unexpected at all that multiplier items are welcomed by players. Despite this, this is over-exploited by publishers. Restrains must be put upon these multipliers, otherwise the game itself will not be sustainable. What’s better than playing that game without having the need to play the game? Yes, this is an extremely stupid question at face value. However, this statement is very applicable to today’s outcome orientated players. The average player is simply older nowadays, and there are way more alternative forms of entertainment. Driven by mainly the fruits of their repetitive leveling experience, they would rejoice at the thought of bypassing the grinding process altogether. Of course then, autopilot systems, which effectively rids the leveling process, is fully endorsed by today’s companies. Contrary to popular belief, the concept behind auto-leveling systems is rather commendable. It merely marks the industry’s attempt in adapting to a different time and a different player population. Whilst the change itself may be negative, the adaption by the industry is positive. Instead, what is blameworthy is the specific approach of how these systems are implemented by Web MMORPG publishers. The optimal method is that of a partial one, where player involvement is still required for leveling, albeit very minimally. This approach is exemplified in RuneScape, where for many activities, players only have to click once every five minutes. This allows players to multitask other more enjoyable forms of entertainment whilst simultaneously playing the game, and yet still ensures player attachment. On the other hand, what Crystal Saga and its many counterparts adopted was a full AFK model. Here, players can set up a robot, which holistically mimics his manual leveling experience. Players will never have to be physically in front of the computer again to ‘play the game’. This brings an obvious rhetorical question – if the player can be a part of the game without even playing it, then what is the point of said game in the first place? Players might as well be quitting altogether and move onto something he or she is actually interested in. Of course, for short-term profit hungry Web MMO publishers, another player desire is simply another opportunity for exploitation. In games such as Crystal Saga, free autopilot allowance points are offered for new players to the game. However, beyond that, players will have to purchase refills from the cash shop. The autopilot capability then effectively becomes a core game resource. Consequently, the aforesaid cash shop effect is only further magnified. Has the golden age for web MMOs truly elapsed? We answer this question with a firm ‘yes’. However, the downfall of this genre is not solely precipitated by the changing demands of the market. Instead, recent publishers have made various sub-optimal decisions. These decisions had translated into undesirable game characteristics. It is these mistakes which very much accelerated the decline of the genre. To reverse the trend, definitive changes must be made. We will explore possible fixes in a future article.